2018 Tata Tigor Old vs New: Major Differences. Tata Motors launched the 2018 Tigor facelift at a starting price of Rs 5.20 lakh (ex-showroom, Delhi). In order to distinguish it from the outgoing model, Tata has given the new Tigor some minor cosmetic changes as well as new features. Read on to find out what all has changed. As you can see, there is absolutely no change in dimensions between the two models. This is not surprising as the Tigor was first launched just over a year ago and a facelift so soon would be unlikely to incorporate any structural changes at all. Even the ground clearance and boot space remain identical between the two. The Tigor facelift looks largely the same as the old one but there are some small differences. The headlight design has been tweaked slightly as the dual projectors now get a chrome finish. The front grille has the same design but now has a chrome finish too for the diamond grill look. Once at the rear of Tata’s “styleback” sub-compact sedan, there are two clear differences on the 2018 Tigor: new clear lens LED taillamps and a black shark fin antenna. The Tata Tigor is also available in a new colour: Egyptian Blue. Most of the changes in the Tigor facelift become apparent once inside the cabin. The dual tone theme is replaced by a more serious black and grey theme. In the top variant you can also have titanium colour faux leather seats instead of the usual fabric upholstery. The shape and size of the central console remains the same but the bigger touchscreen infotainment system rids it of some of the button controls for a cleaner look. Unlike the outgoing model, the 2018 Tata Tigor offers dual front airbags as standard across all variants as well as seatbelt with pretensioners and load limiters and driver seatbelt reminder. Other safety features like ABS with EBD, cornering stability control and parking sensors are still offered only in the higher trims while park assist with camera is restricted to the top variant only. Surprisingly the follow-me-headlamps were offered on all variants above the entry level XE before, but it is now offered only above the XM variant. A new bigger 7-inch touchscreen infotainment system can be found in the top-level 2018 Tigor as compared to the 5-inch touchscreen on the outgoing model. The functions list remains unchanged with bluetooth connectivity, voice command through Android Auto and Tata’s ConnectNext application suite. The top-trim also gets a total of 8 speakers for the audio system (4 speakers and 4 tweeters), same as before. 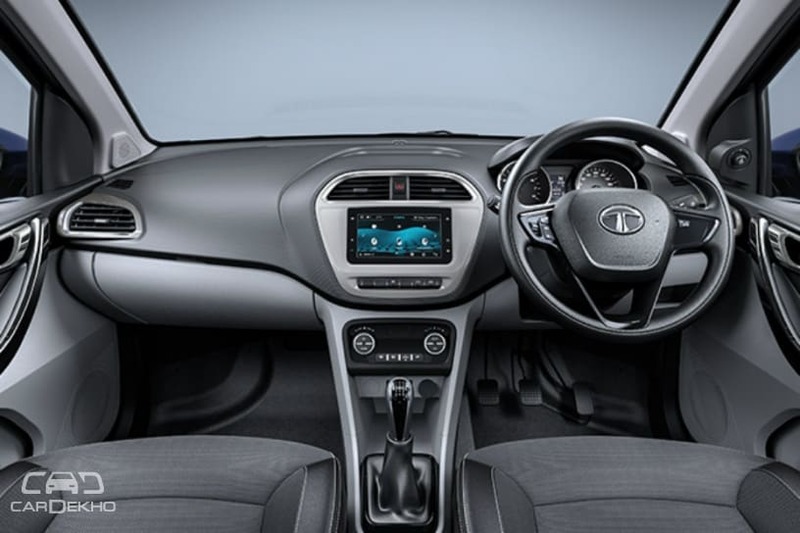 The updated Tata Tigor is equipped with auto folding ORVMs in the top trim which were not available previously. The foldable armrest on the rear seat with cup holders now comes as standard across all variants. It was previously available from the XT variant onwards. Other features that are now equipped as standard include driver seat height adjustment, adjustable front headrests and vanity mirrors on driver as well as co-driver side. The digitally controlled fully automatic climate control system is still restricted to the top variant only. The 1.2-litre 3-cylinder petrol engine produces a maximum of 85PS of power and 114Nm of torque. The 1.05-litre 3-cylinder diesel engine produces a maximum of 70PS of power and 140Nm of torque. The 5-speed AMT is only available with the petrol engine, while the 5-speed manual transmission is offered on both engines. Tata used to offer the outgoing Tigor in 7 variants – XE, XM, XT, XTA, XZ, XZA and XZ (O). However, the 2018 Tata Tigor is only available in 5 variants – XE, XM, XZ, XZA and XZ Plus. The new Tata Tigor starts at a slight premium over the outgoing model, but offers more safety features as standard as a result. On the top end, the price sees little to no change for the added features, thus offering better value for money. It still undercuts its rivals like the Honda Amaze, Maruti Suzuki Dzire, Ford Aspire, Hyundai Xcent and Volkswagen Ameo.